july 24, 2000. 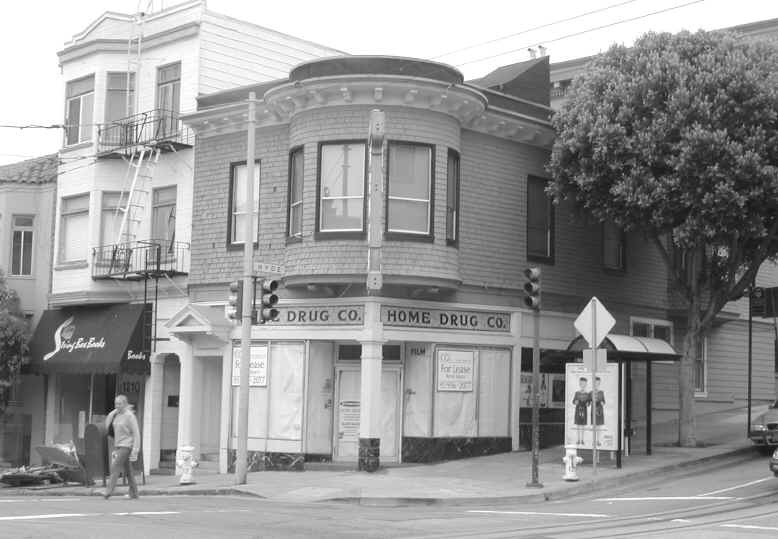 If you read the Chronicle, you know that the latest casualty of the new economy is the Home Drug Co., on the northwest corner of Union and Hyde. It’s a fine old pharmacy. But times have changed. Pharmacist Eugene Malmquist says his profit margin has been cut in half over the past thirteen years. Carlo Michelotti, head of the California Pharmacists Association, blames competition from the chains. Malmquist blames the HMOs, which have usurped his control over prices. Both suggest a brave new world where the big guys call the shots and the little guys cry uncle. That’s pretty much the lore of the day. Small farmers and shopkeepers — the sturdy independent citizens who traditionally gave the United States its strength — are passé. Forget about the stubborn band of soldiers and solons who stood up to King George and pieced together a patchwork quilt of a nation the likes of which had never been seen before. Today that only happens in the movies. Today these vertebrae in the backbone of democracy have been replaced, in the courts and in the eyes of the public, by a liberal economic scaffold composed of national or multinational producers and local consumers. Because of economies of scale, these producers can offer lower prices and higher employment than their two-bit predecessors. As a result, they offer salvation. That’s the lore. But sometimes lore lies. A new book by Stacy Mitchell called The Home Town Advantage suggests that this particular lore, which we have endowed with the force of natural law, is actually still in the formative stage. Which means that it ain’t necessarily so. Yes, it is true that chains and mass merchandisers are doing their best to take over markets. Barnes & Noble and Borders Books account for 25 percent of the U.S. book market, with independent booksellers taking care of only 17 percent. Home Depot and Lowe’s control 25 percent of all hardware and building supply sales. And so on. But all too often these giants also extract a painful price from the community where they are located. When Wal-Mart moved into nine Iowa counties, for example, rather than adding to local economies, it simply shifted things around: 84 percent of its sales were at the expense of existing businesses. Nevertheless, the lore insists, small shops and manufacturers can’t compete with the behemoths. Not so, says Mitchell. It’s all a matter of doing your homework, knowing what you want, and coordinating with other like-minded organizations. Just as activists groups in the Mission have found success through coalitions, so business alliances — either of similar organizations over large areas, or across different sectors within one community — are finding ways to reestablish local clout. Ace Hardware and TruServ, the two largest cooperatives of previously independent hardware dealers, are breathing hard on Home Depot’s neck with 20 percent of the market. And about 125 local firms in Boulder, Colorado, have decided to try a city-wide approach, relying on the Boulder Independent Business Alliance to lead them into the fray.